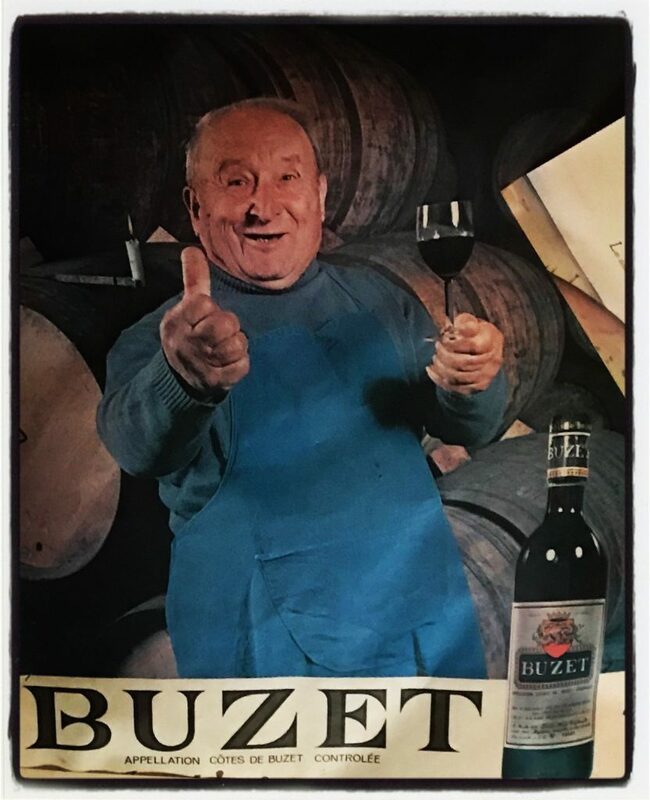 As a young, novice consumer in the early 1980s, this poster from the time offers an endearing memory of the wines of Buzet. It features Monsieur René Bouglon, cellarmaster and vigneron at what was once known as Les Vignerons Réunis des Côtes de Buzet. Today, his great-grand daughter, Elodie Cambos, maintains the tradition, being both a wine-grower herself and a member of the cooperatives board. 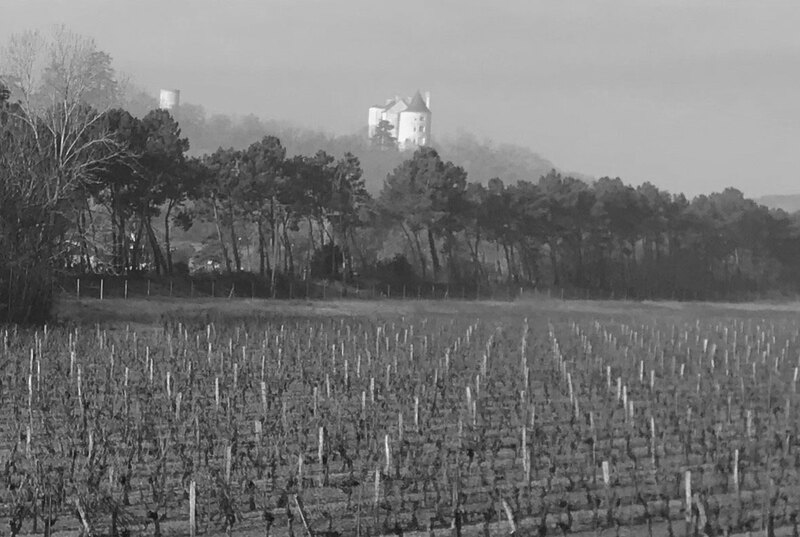 The vineyards of Buzet lie on the south bank of Garonne, between the towns of Agen and Marmande. This is gentle countryside, where the little river Baise, a tributary of the Garonne, flows through the vineyards past the village of Buzet, one of 27 communes that make up the appellation. The Romans came here first, spreading viticulture through South West France. But the area is richer in vestiges of the Middle Ages, for the vineyards of Buzet were cultivated by the monks of the abbeys of Fontclaire, Buzet and St Vincent. The area supported the English crown during the Hundred Years War. As a result, the wines of Buzet were amongst those of the Haut-Pays which the Bordelais refused to allow into the city until after St Martin’s Day on the 11th November. Cahors suffered a similar fate. The vineyards were greatly reduced post-phylloxera with any incentive to replant negated when, in 1911, a ministerial decree limited the region of Bordeaux to those grown exclusively within the département of the Gironde. Buzet was thereafter deprived of its chief market. Until then, much of its production had found its way to Bordeaux, where it had historically been blended as vin de médicin to bolster lighter clarets. The rural de-population following the First World War reduced the vineyards still further, so when the local Syndicat was founded in 1946, there were few vineyards remaining on which to build any future appellation. The Buzet co-operative was founded in 1953. Around this period, négociants were reluctant to pay any more for the a VDQS wine than for an anonymous vin ordinaire. The co-operatives success in changing this perception saw the Côtes de Buzet being awarded full appellation status in 1973. The name was simplified to Buzet from the 1988 vintage. Today, the appellation is a virtual monopoly, with the co-operative accounting for 94% of the appellations output, although a number of independent growers have developed their own estates on the back of the co-operatives success. Although white and pinks wines are allowed, Buzet essentially remains a red wine appellation. The grape varieties are those of Bordeaux, with Merlot dominating (responsible for half the entire plantings) and augmented with Cabernet Sauvignon and Cabernet Franc. A little Malbec is also grown. For the 3% white wine produced, Semillon represents 70% of the plantings, with 30% Sauvignon Blanc. The soils are mainly clay and limestone, with boulbènes, a mixture of sand and clay, and a high proportion of gravel. The climate is similar to that of the Gironde, although the enormous forests of the Landes to the South of Buzet have some influence on this. Spring frosts can be a problem, as is the occasional hailstorm. The grapes usually ripen a week later than in the Gironde, although the quality and style of the vintages generally follow those of Bordeaux. Les Vignerons de Buzet now consists of 188 members who between them cultivate 1,870 hectares of vines. Twelve to 15 hectares is the size of an average property. There are a few growers for whom vines are their principal source of income. Others practice polyculture, with orchards or grow melons, strawberries and wheat on the plain. In 1976 vin de table accounted for two thirds of the co-operative’s total production of 60,000 hectolitres. By 1983, production had increased to about 80,000 hectolitres, of which 55,000 to 60,000 hectolitres had been converted to appellation Côtes de Buzet. Today, the winery produces the equivalent of 12 million bottles per year, all of which leave the cellar as a packaged product. The most striking aspect of the ageing process at the co-operative is the use of 225-litre barrels. During the 1970s and 1980s, this was probably the only co-operative in France with its own resident cooper. Yves St-Martin had trained at the cooperage school in Beaune. Today, the cellar still has an impressive oak-aging regime, although the in-house cooperage has been out-sourced to a private enterprise which at least remains within the appellation. A careful selection of grapes and cuvées is made so that wines are given the amount of wood ageing appropriate to their composition. The barrels of Tronçais oak, are replaced every five years. The best wines spend six months in new oak, followed by six months in older wood. The co-operative has various estates, whose wines are vinified separately. The flagship property is Château de Gueyze (pronounced ‘Gaze’), which spends six months in one-year-old wood and is a firmer, more style of wine, characteristic of the terroir with excellent ageing potential. The château itself is a delightful French property, in the recognisable style of the region. The range starts with Buzet ‘Tradition’. Echoing the plantings of the co-operative, this is a blend of 55% Merlot with equal parts of the two Cabernets. During the 1970s and 1980s, a wine sold as Cuvée Napoléon was produced. The name was well known in the UK market, until about 20 years ago when a Cognac producer reminded the cellar of a trademark and asked for a royalty. The label was withdrawn. Today, the same cuvee exists as ‘Baron d’Ardeuil and is the most noticeably oaked cuvee of the Buzet range. A companion white also exists. For more than the last ten years, the co-operative has sought to improve its social and environmental responsibilities, introducing initiatives throughout the production process, from the vineyard to the cellar door. Whilst the climate doesn’t allow for a complete transformation to certified organic viticulture, the members have all abandoned chemical treatments for botrytis and mildew, as well as insecticides and herbicides. Modern techniques for the generation of electricity means that the cellar is 95% self-sufficient. By far the most impressive project, however, has been the establishment of a aquapark on low-lying land (next to the autoroute) which, using indigenous plants as natural filters, recycles waste water.